Data Points is a more solid work than Visualize This! 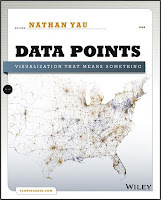 Nothing against Nathan's first book, but I found it disappointing because it read like a disjointed programming handbook, rather than like a true “guide to design, visualization, and statistics”, which is what its subtitle promises. I don't want to be unfair, though, so I'll admit that perhaps I'm not its target audience. Its many reviewers in Amazon praise it almost unanimously, after all. The subtitle for Data Points matches its content better: Visualization that means something. The first part of the book is mainly a showcase of creative and inspiring visualization projects. To envision what it looks like, think of the FlowingData blog on steroids, but with deeper and more informative comments by the author. I'm not fond of all the examples, but I found this portion very valuable anyway. My main complaint is that the first chapter, titled 'Understanding Data', doesn't really deliver a systematic overview of statistical methods that visualization designers need to be aware of, but just some slightly random (although useful, don't get me wrong) notes on what to do or what to avoid. Given Nathan's background on statistics, perhaps I expected too much in this regard. The second part of the book is a fine collection of visualization techniques, strategies, graphs, and data maps aimed at beginners. This half is the strongest of the two. 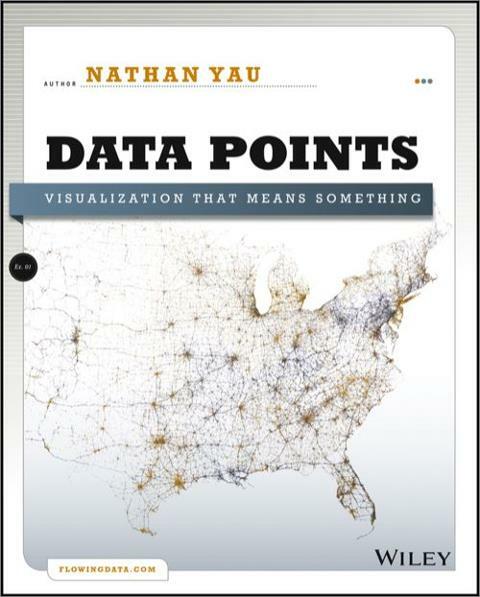 It's refreshing to see that Nathan discusses graphic forms that are uncommon outside academic and scientific circles, such as the parallel coordinate plot and the scatter plot matrix. It is also encouraging that the book outlines some rules of thumb on how to make visual displays look better based on classic principles of Graphic Design. Finally, Nathan's insistence on correctly labeling and annotating graphics should be useful for visualization designers with a background on statistics and computer science who wish to communicate with the general public. This part is so good that it left me craving for more. Therefore, there's plenty to praise in Data Points, but also a few important things to disagree with. For instance, some of Nathan's recent comments —reflected in the book— are bizarre, textbook examples of the straw man fallacy. Nobody that I know approaches visualization as an “unyielding” —an adjective repeated several times in Data Points— tool, not even the most ardent efficiency crusaders. And it is inexact to say that there are folks out there who think that “almost every graphic would be better as a bar graph.” To put it bluntly, I believe that remarks like this are too simplistic and don't belong in an otherwise worthy book whose aim is to give designers clues about how to deal with complexity. Anyway, my two cents. Read a complete chapter of Data Points here, and don't miss its promotional video. Finally, get the book.